Tuesdays are crazy. My energy level is at its lowest. I'm still exhausted from Monday and the middle of the week is yet to come. So Tuesday is my designated Crock Pot day. I don't know about you, but I get an overwhelming sense of comfort, even in these times of plenty, knowing that dinner is cooking and my family will have a nutritious, hot meal to come home to. (Without complications from my chaotic schedule). It must stem from some ancient, collective memory of when times were lean and food was scarce. Or maybe it harkens back to my childhood. I remember walking home from school, wallowing in teenage melancholy. When entering the house, the aroma of something simmering away in my mother's pea-green slow cooker would quickly soothe all my cares away. Perhaps I want to establish a sense of calm, in this out of control world, for my family, for my kids. As funny as it may sound, my Crock Pot helps create an oasis in the midst of the storm. Can you relate? So naturally I've amassed quite a collection of my favorites Crock Pot recipes. On top of that, I recently purchased Michele Scicolone's latest cookbook "The French Slow Cooker." I was intrigued immediately. I'd never considered converting any of my favorite French recipes to the slow cooker . . . Sacrilege! I am, however, looking forward to diving into this book and seeing exactly how she did it, and adding still more variety to our Tuesday menu. Not to mention the photos, by Alan Richardson, are spectacular! 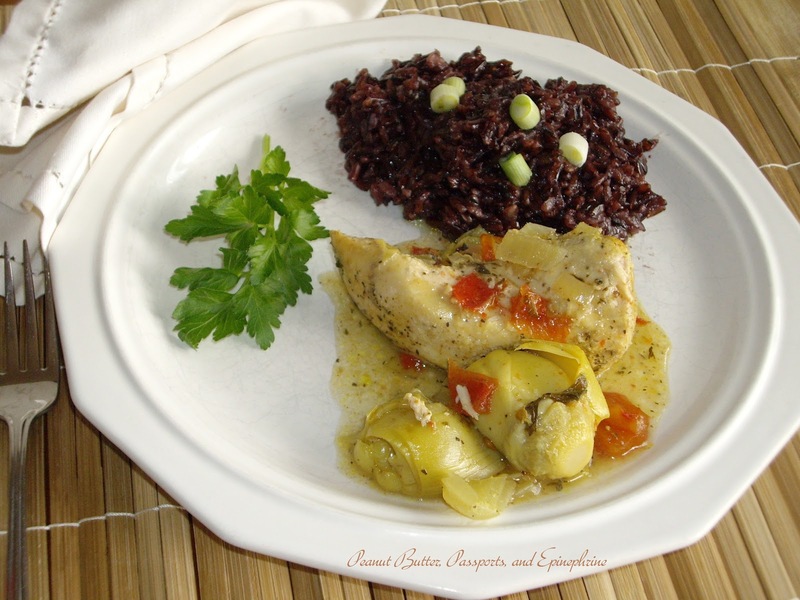 I've had this recipe for Herbed Chicken and Artichokes in my old, wooden recipe box for ages. I don't honestly remember where it came from. I believe it was in the back of one of my slow cookers' manuals. But let me tell you, this is one of the very best Crock Pot recipes I've found. I've made it with couscous, egg noodles, baguette, mash potatoes, and we all agree that it's best with rice. 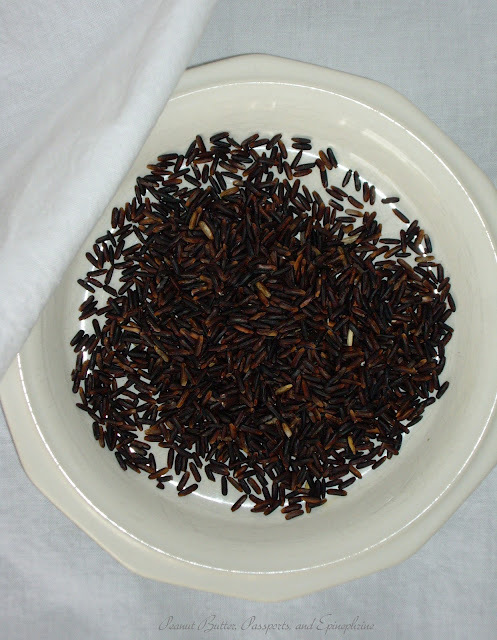 I found this alluring black rice at the market a couple weeks back, and I've been anxious to use it. E claimed that it was the best rice she's ever had (in all her three long years), and after I told C the story of how it became known as Forbidden Rice, even he ate every last grain on his plate. What more could I ask for on a crazy Tuesday evening? Combine everything except the olives in the slow cooker. Cook on low for 6 to 8 hours. Add the olives in the last half hour of cooking. Garnish with more chopped flat leaf parsley, and serve over rice or with good, crusty bread. *NOTE FOR THOSE WITH PEANUT ALLERGIES: Most curry powders contain Fenugreek, which can cause an allergic reaction in people with allergies to peanuts and tree nuts. If you are at all unsure whether you or your child can eat Fenugreek, please speak with your allergist before using curry powder. When you start the crock pot, start soaking the rice as well. Combine the rice, 1 cup of water, and the vinegar in a bowl. Cover and let soak at room temperature for at least 7 hours. When ready to cook, pour the contents of the bowl into a heavy sauce pan with a tight lid. Add the remaining 3/4 cup water and a pinch of salt. Bring to a boil. Cover and turn the heat to low. Simmer for 30 minutes until most of the water is absorbed. Remove from the heat and let sit uncovered for five minutes. Fluff with a fork. Stir in the coconut oil, onions, and a pinch more salt if needed. Two for One: I added two extra chicken breasts to the Crock Pot so that I could make Chicken Divan the next evening. Hi Rebecca, this looks amazing! 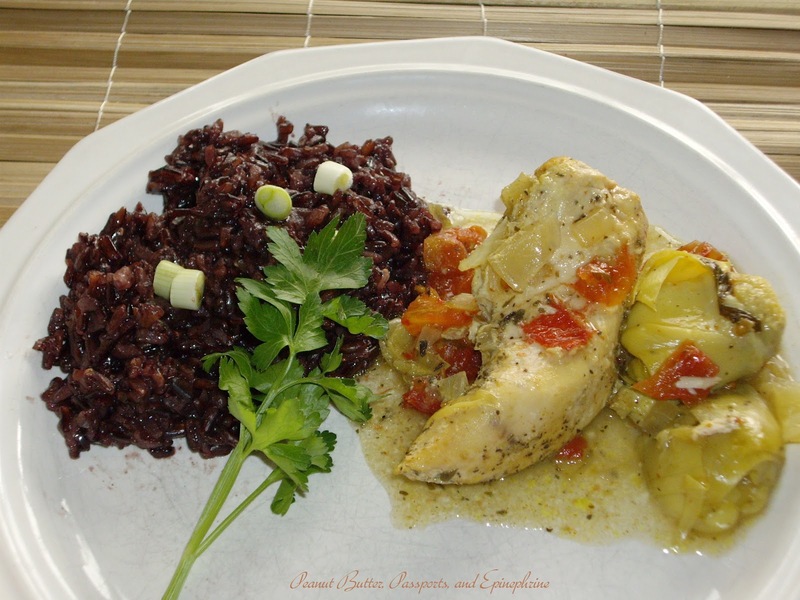 Love the chicken and artichoke combo, and ages ago I had that black rice which was soooo good! You've reminded me to look out for it again! I'm pinning this, thanks! Thanks, Debbie. And thanks for the pin! I love this foribidden rice, I think you can try to cook with coconut milk it will be more tasty. Thanks for sharing with Hearth and Soul blog hop. Swathi - I thought about cooking in coconut milk, but I wondered if it would take away from the purple colour and make it sort of grey. Also, my kids aren't so fond of coconut milk. Crazy, huh? I do love coconut rice, so maybe I'll try it next time! Thanks for stopping by! My daughter and I love artichokes. The rice looks fascinating. Please share this on my foodie friday party today. I will pin it too. Thanks, Diane. I'd love to share. Thanks for the invite! I am featuring your wonderful recipe on Foodie Friday today. Stop by and get your featured button. Thank you Diane! I'm honoured! I am always looking for tasty, healthy dinner recipes to make for my family. This recipe is now on my to-make list! :) Thank you so much for sharing your great recipe on Allergy-Free Wednesdays! Be sure to check back next week for recipe highlights (including the top 3 reader choice submissions and hostess favorites). Both recipes sound amazing! I have really grown fond of artichokes and I love the simplicity of making dinner in a crockpot. Thanks Alea! The crock pot has to be my all time favourite kitchen appliance. Your recipe is featured on Full Plate Thursday this week. Hope you have a very special week end and enjoy your new Red Plate! Thank you so much, Miz Helen! I'll be back soon! Rebecca , I'll have to say that every single Dish on your site , looks Fantastic and very very Appetizer, Excellent job.